While you are searching for the best HCG book, HCG diet books or HCG Cookbooks to use while on HCG P2 and HCG P3 it's good to read HCG Book Reviews. 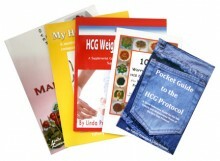 For that reason we have provided HCG book summaries and HCG book reviews for several of the HCG diet books that are available on HCGDietBooks.com. Just click below to start reading HCG Book Reviews for the following HCG Books: HCG Weight Loss Cure Guide, the Pocket Guide to the HCG Protocol, the My HCG Tracker, the 101 Worry - Free HCG Recipes Book, and the Over 201 Worry - Free HCG Maintenance Recipes Book.